It’s a perfect time of year to be outside, strolling through the Renaissance, and viewing gorgeous autos and motorcycles. This year the event will be held on Saturday, October 12th, from 10 a.m. to 5 p.m. The show is open to all European Marques with no registration fees and is free to the public as well. Over 15,000 spectators are expected to view 150 entries manufactured in five different countries, coming from ten different states. 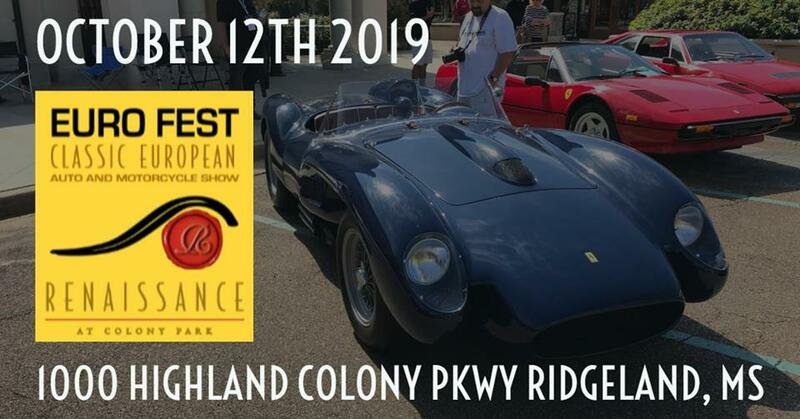 If you are interested in entering an auto or motorcycle in the show, you may find an entry form at www.euro-fest.net THERE IS NO ENTRY FEE FOR PARTICIPANTS, BUT ALL PARTICIPANTS MUST REGISTER VIA OUR WEBSITE WITH HIST APPROVAL. This year’s show will begin Friday, October 11th with optional drives departing Memphis and New Orleans, coming together at the show site for the combine and escorted, Renaissance Rally Drive, starting at 3:00 on Friday, October 11th, from the Hyatt Hotel at the Renaissance. The police-escorted drive will travel on an enjoyable route to an equally enjoyable location and then back to the Renaissance for the “Pick Up Your Packet” Reception that evening. For More Information, please click the topics at the top of the web site or contact Mike_Marsh@bellsouth.net for details.